Step out of New Delhi with an excursion to Cyber Hub in Gurugram (Gurgaon)--about 36 minutes away. Spend the 22nd (Tue) on the rails with a train tour. 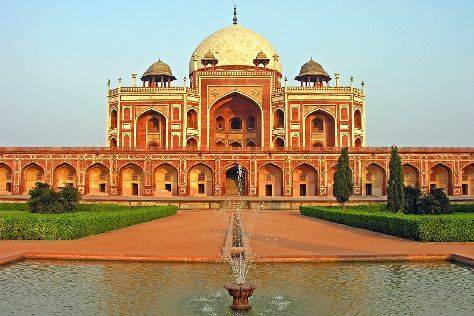 And it doesn't end there: admire the striking features of Humayun's Tomb, contemplate in the serene atmosphere at Friday Mosque (Jama Masjid), indulge in some culinary diversions at a local gastronomic tour, and steep yourself in history at Gurudwara Bangla Sahib. To find maps, reviews, ratings, and more tourist information, refer to the New Delhi online tour itinerary builder . Cape Town, South Africa to New Delhi is an approximately 17.5-hour flight. Traveling from Cape Town to New Delhi, you'll lose 3 hours due to the time zone difference. Prepare for a bit warmer weather when traveling from Cape Town in October: high temperatures in New Delhi hover around 39°C and lows are around 24°C. Finish your sightseeing early on the 23rd (Wed) so you can travel back home.